This is the place to find Paragon Kilns Heat Treating and Knife Making Furnaces for sale. For heat treating Paragon is the kiln of choice for knife makers and other metal workers. There are many available options such as view windows and gas injection flow meter to suit every need. The gas injection flow meter on your furnace. It is available as either an add-on kit, or you can order the furnace with the meter installed. Order your knife heat treating oven from Sheffield Pottery with low prices and free shipping to the lower 48 states! Paragon knife treating ovens, proudly made in America, have earned a fine reputation among some of the most discerning craftsmen in the world. The drop door counter-balance handle keeps the door closed tightly. The door swivels on a heavy steel rod with bearings. 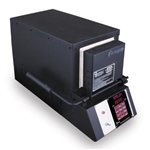 Paragon uses the reliable Orton digital temperature controller. Orton is well known for accuracy in the pottery field. Paragon furnaces include a door safety switch that turns off the heating elements when you open the door, yet the temperature controller remains powered. The furnace manual includes instructions for heat treating D-2, 440C, ATS 34, 154 CM, O-1, and A-2 high carbon steels.